Help individuals that have been rescued by providing necessary items for our Dignity Bags- A backpack filled with clothing, shoes, toiletries, tooth brush, toothpaste, shampoo, soap, moisturizer, journal, chapstick, bottled water and granola bar. Donate funds $5, $10, $15, $20, $25, $50, $100 or help with cost of tuition. Spending the day with a 16 year old survivor of Child Trafficking was an amazing experience. I met her and her mother at the Ranch and we were all very excited to be there. The Owner of the horse and Trainers quickly greeted us, and we were soon standing in front of three gorgeous Peruvian horses! Two of the stallions were Champion Horses and one was even in the Rose Parade. The horses stood strong and proud, yet there was a gentle welcoming side to them as well. The girl walked up to the middle horse and the trainer said "go ahead, pet him". She slowly raised her hand and pet him softly above his nose. Now it was time to brush him and place the saddle on him- one must do this before every ride. 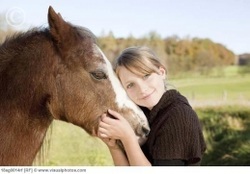 She grinned and instantly had a connection with the horse. We all walked over to the arena and the trainer had her mounted on the horse within minutes. She rode him around next to the fence, pranced, walked in circles and had a grin ear to ear the entire time! We all did for that matter! The owner said "she's a natural", she rode perfectly with excellent posture. Everyone was so proud of her! When she was done with her lesson she walked the horse back to the stall and brushed him and returned the saddle back to the trainer. She met other famous horses even a pregnant horse about to give birth. The weather was perfect, the horse was showing off and we all had a terrific day! Thank you to Women Against Child Trafficking for providing mentors!!! Justice Matters Conference RecapOn February 18, 2012, Slavery No More hosted by Calvary Murrieta, held a Justice Matters Conference to combat Human Trafficking and Modern Day Slavery. There were over 15 Guest Speakers, they included; Representatives from the Riverside Sheriff’s Department, FBI, Operation SafeHouse, survivors, and various organizations that advocate against Human Trafficking and Slavery. Over 500 people attended, the first 300 hundred registered people received a free Fair Trade canvas tote bag that had the Slavery No More logo on it. The attendees also had the privilege of talking with over 20 exhibitors who specialized in Human Trafficking, Modern Day Slavery, Children at Risk, and Fair Trade. To round out the event, Shannon Sergey of Forever Found led worship before and throughout the conference.